Arsenal are reportedly prepared to sanction the sale Mesut Ozil to Manchester United in January, should they match his £30m valuation. 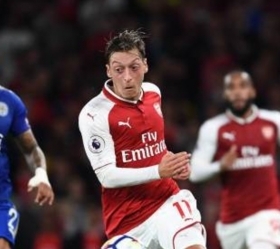 The 29-year-old has declined to extend his Gunners contract in spite of a series of negotiations, and he looks on course to leave on a free at the end of the campaign. Ozil is currently on a £140,000-a-week package with the north London club, and he is said to want at least twice the salary alongside the number 10 shirt - currently worn by Jack Wilshere. According to The Daily Star, Arsene Wenger has reluctantly conceded the German's sale in the New Year, although any interested clubs will have to match their £30m asking price. Manchester United are presently the leading candidates to pursue the World Cup winner with Jose Mourinho holding a close relationship with the attacker - with whom he worked together at Real Madrid. Henrikh Mkhitaryan has struggled to showcase his best form since the start of October, and Ozil could be deemed as a key player in the number 10 role where United have often lacked the creativity.